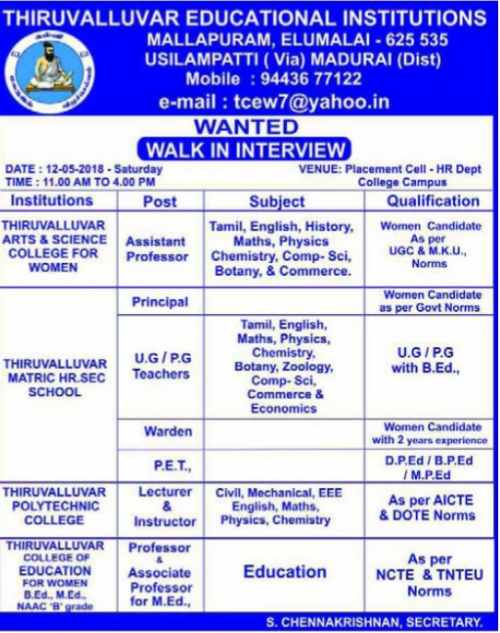 Thiruvalluvar Educational Institutions, Madurai, has advertised in THE DINAMALAR newspaper for recruitment of Principal/Professor/Associate/Assistant Professor jobs vacancies. Interested and eligible job aspirants are requested to attend interview on 12/05/2018. Check out further more details below. 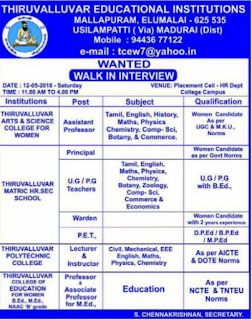 Name of the College :Thiruvalluvar Arts & Science College For Women, Thiruvalluvar Matric Hr Sec School,Thiruvalluvar Polytechnic College, Thiruvalluvar College of Education for Women, Madurai. About College:Thiruvalluvar Institute college is the only four-year college in Elumalai with selective admissions. Students can choose from eleven undergraduate majors and five graduate programs. The college takes pride in the close relationship between students and faculty, the hands-on approach to learning, and the high levels of student engagement. Academics are supported by a healthy 10 to 1 student / faculty ratio. If you're worried about attending such a small school with under 1,000 students, realize that the college of Elumalai Anchorage and its 18,000 students is next door. As per AICTE /UGC/DOTE/NCTE/TNTEU norms. Principal: Women candidate as per govt norms.